Video: That Belly Landing In Newark? Yeah, There's A Grainy Video | OhGizmo! By David Ponce on 05/20/13 • Leave a comment! 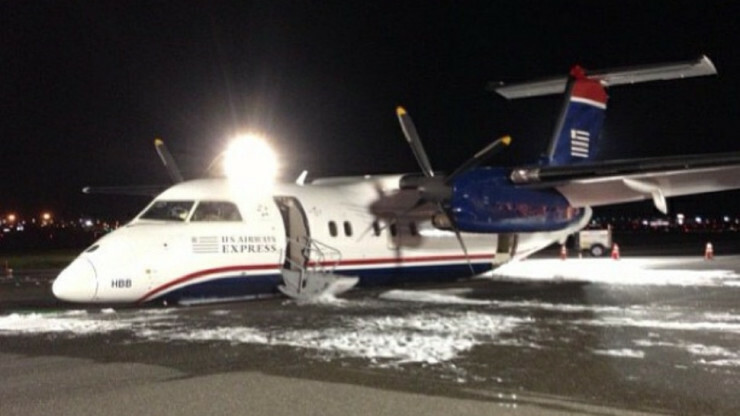 You guys might have heard about the US Airways Express Flight 4560 that landed on its belly last week. It was carrying 31 passengers plus crew, and through the skillful piloting of Captain Edward Powers, was able to land safely despite not having been able to deploy its landing gear. Well, there’s a video of the feat, albeit one apparently shot from the Newark terminal on a Nokia flip phone from 2001. Or a potato. Or something. Point is, you see very little, but it’s impressive nonetheless. A few more details about the flight. On approach to Newark, Captain Powers noticed the landing gear wasn’t lowering properly. Even after repeated attempts, nothing was to be done. So the decision was made to retract fully and attempt a belly landing, but not before circling the airport for an hour to empty the fuel reserves and minimize the risk of a fire. So while things don’t quite always work out, it’s reassuring to know that belly landings can be done and aren’t an automatic death sentence.